Forget the flowers. To get me weak in the knees, give me a luscious bunch of orange and fuschia chard. Swiss chard (silverbeet for some of you) is good eating, don’t get me wrong. But damn is it fine to look at! Those Rubenesque stems in every color imaginable. Those enormous succulent dark green wrinkled velvet leaves. Oh my! And that chard, true to it’s lascivious proportions, keeps on putting out! Every trip to the garden lately finds me returning with a 10 pound bouquet. Enter my latest, and possibly best to date, recipe brainchild. Unlike that last recipe for empanadas, this is easy! Quick! Nutritious! And extremely tasty! 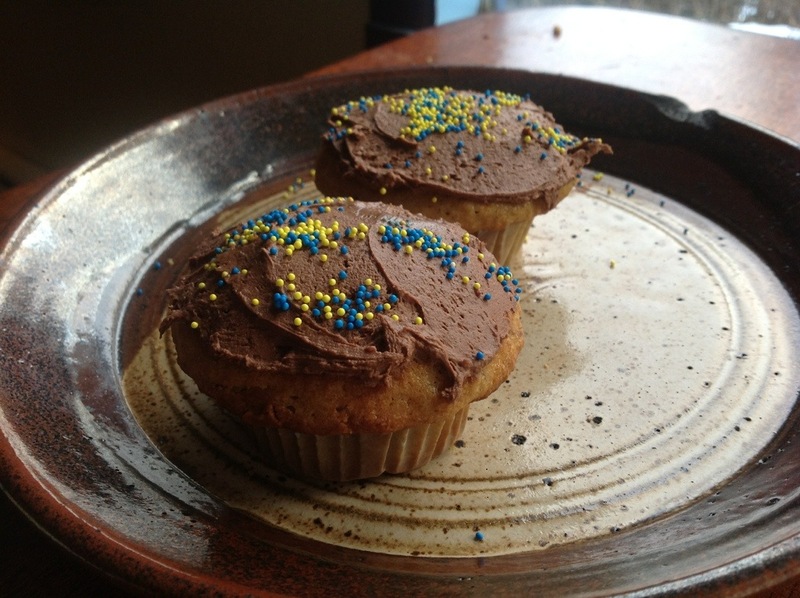 Dare I say, these muffins do a better housewife make…. Now, understand that I do not mean savory, cheesy chard muffins, which would be delicious in their own right. I mean sweet chard muffins. Like carrot cake or zucchini bread. I’m not the first person to think of vegetables going sweet, but I’ve never heard of a sweet greens recipes before. Have any of you? I first got the fire under my kettle for Swiss chard muffins a few weeks ago. I don’t remember how or why, but suddenly I found myself thinking, ‘chard stems—rhubarb… chard greens—sorrel pudding (Icelandic)… zucchini bread… chard muffins!’ and I knew I had to try it. I did almost chicken-out at the last minute and go the savory direction. But fortunately for all of us, and generations to come, I powered through the second-guessing and gave it a go. What’ve I got to lose anyway? There is an ever so slightly mineral, beety flavor to these which could potentially put picky people off, but it’s very, very slight. 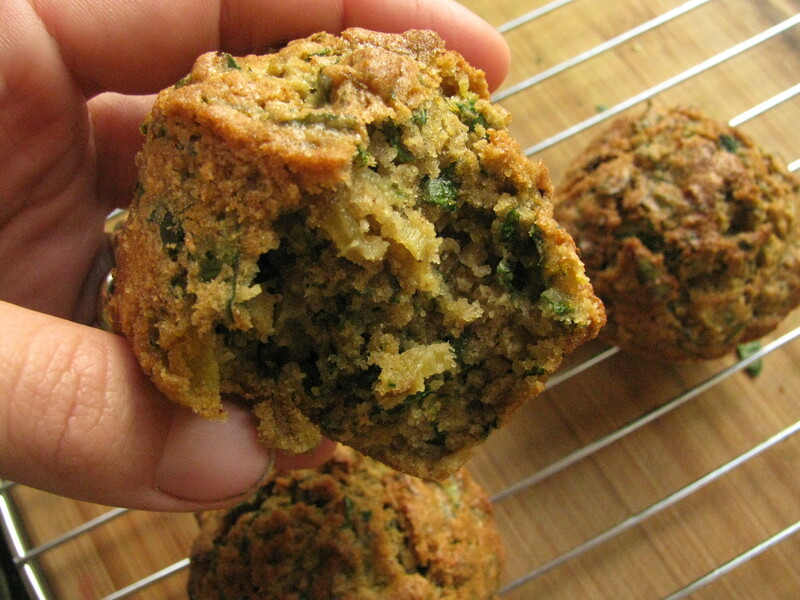 I can almost guarantee that if you like zucchini bread you’ll like these. I personally found that the barely detectable mineral flavor gave the sweetness complexity. 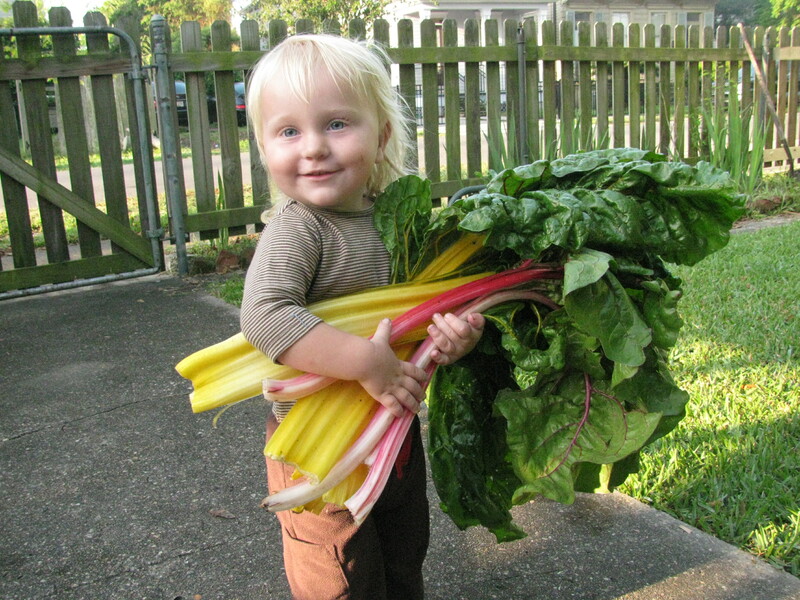 If you wash your chard, be sure to dry it thoroughly before adding it, or it will make the batter too wet. You can use both stems and leaves, or just the stems. I’ve tried both and couldn’t really taste the difference. But if you have little people who might be offended by green specks, leave them out. Plus, isn’t it nice to have a way to use up all that extra stem? Slice the stems very thinly, almost shredding them. If the ribs are very wide, cut in half lengthwise first. This recipe makes one dozen. When I make muffins lately I like to bake off half in my little six cup tin in the toaster oven. Then I line another muffin tin with paper liners, fill and freeze the rest. Cook’s Illustrated turned me on to this. Muffin batter freezes great, and you can bake them off straight from the freezer! Who knew? 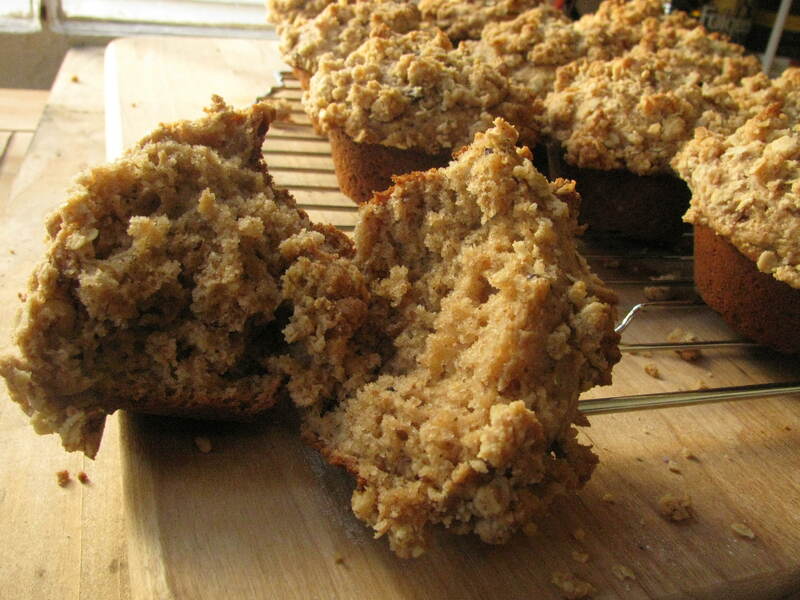 Muffins, especially the whole grain variety, are so much better freshly baked. Now you don’t have to eat them any other way! The frozen muffins only take an extra 10 minutes or so to bake. 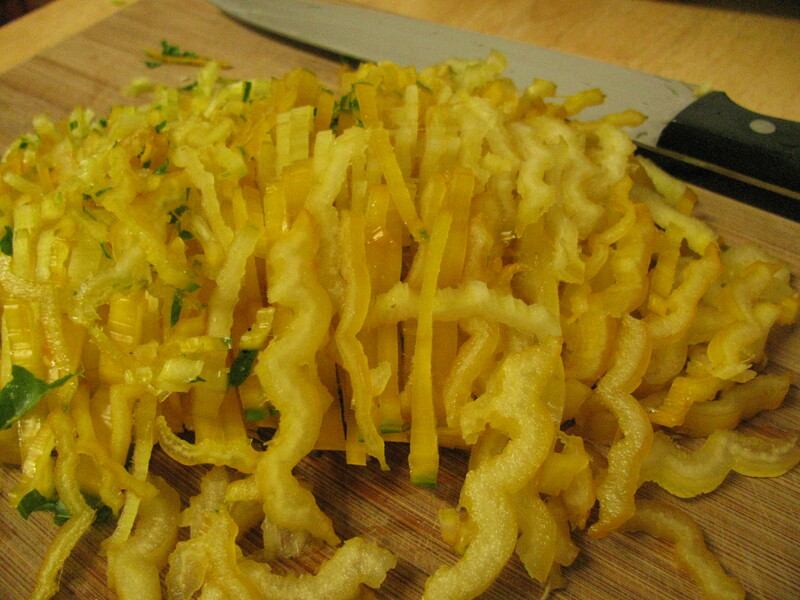 Unlike those pesky empanadas, this is a great recipe for cooks of any skill level! *If you don’t have all those particular spices, use whatever you have. Or use pumpkin pie spice, which is really a great mix. As long as your spices are reasonably fresh (I mean, less than 2 years old) it’ll be good. Preheat oven to 425 F. Starting out at a high heat helps make the lovely domed tops that whole grain muffins often lack. Mix all dry ingredients together in a big bowl. 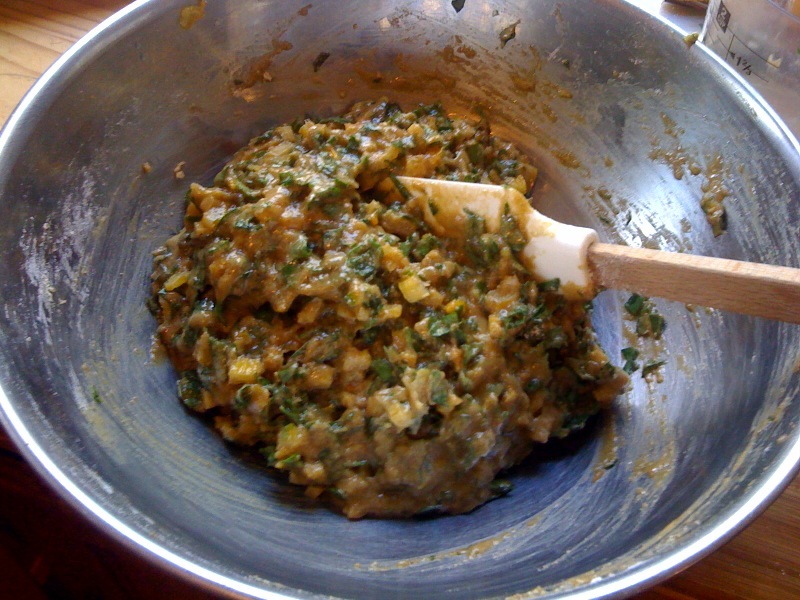 Crack in the eggs, pour in the fats, chard and nuts, and gently fold/stir the lot together. An advantage of whole wheat pastry flour is you really don’t have to worry about overworking the batter. When everything is mostly incorporated, drizzle on the water and keep folding until you have a very thick but workable batter. You might not need both tablespoons of water. Scoop into well buttered or paper lined tins. 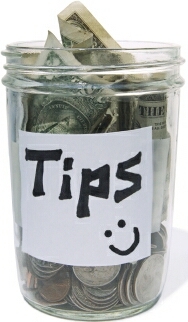 Fill each cup completely, the old advice of 2/3 full might work for white flour muffins, but it doesn’t work for wheat. Put into your preheated oven and leave for ten minutes or so until the edges have set, then lower the temperature to 375 F. Leave another 5-15 minutes. Muffins are done when you can press your finger lightly into the top and feel the spring back of a squishy muffin, instead of the give of puffed raw batter. If you aren’t certain, stick a butter knife into the center muffin. It should come out clean, wet crumbs maybe, but no batter clinging. Allow muffins to rest in pan for ten minutes, then carefully remove to a rack to cool. Or bounce hot muffins back and forth between your fingers, jumping up and down yipping like a coyote. If you want to make your kidlets laugh. Okay, I’m done talking about cleaning. For now. Honest! I have lots of other interesting things to tell you. And I realize I’ve been text heavy lately, so let’s see some pictures, right? Let’s start with my garden, which is a heap of righteous green glory. I can’t believe I am eating out of my garden in January, it’s divine. I have cabbages bigger than your head, a bit of broccoli left, snap peas barely surviving the frosts, salad greens if I could want to eat them, garlic and onions putting on heft (though not bulbing yet of course) and don’t forget collards, as always, pumping out the food in dark green form. If I had planned better, I could have had carrots, spinach, beets and chard right now too. It’s crazy. Winter is actually the favored growing season here, because the buggies are scarce. And it’s not like up north where a winter garden is just harvesting what grew in summer and fall. No, cold season crops really grow here in winter. 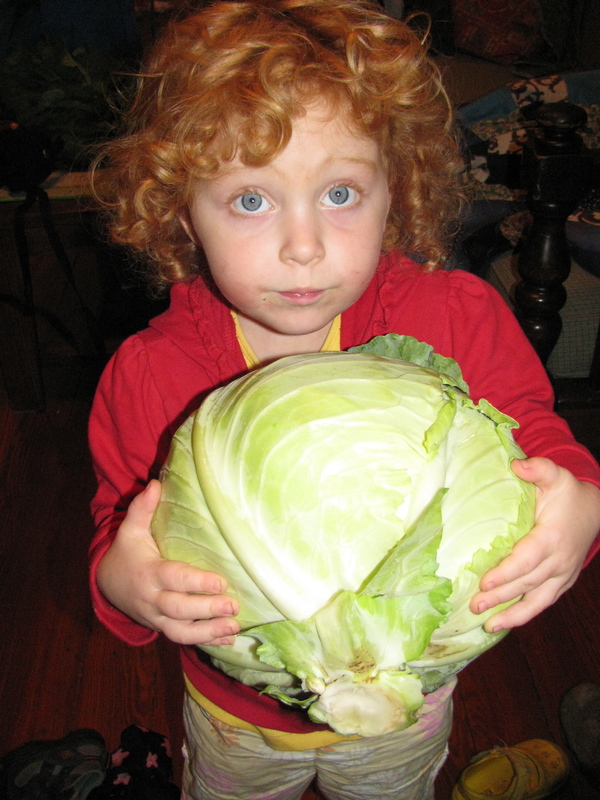 In fact, my Lousiana planting guide says I can start planting my spring crop of all the above mentioned vegetables anytime, though I just can’t make myself do it quite yet. We have some very warm days, but still plenty of frigid days. I might plant a row or two when I head to the garden later today, but mostly I think I’ll wait another week. Then it’ll begin a whole new round of green yumminess. Speaking of green, I feel compelled to tell you about my tomatoes. Before we left for our 3 week Christmas trip I called my Southern gardening guru to ask what I should do about my two huge healthy looking tomato plants, loaded with green fruit. It was really my first success with tomatoes down here, and I was heartbroken to be leaving them. I asked whether I could harvest the green tomatoes and leave them somewhere cool where they wouldn’t freeze in hopes that they would be ripening just as I got back. He said not so much, they’d ripen in a week or two and I’d come back to a rotting pile of gross. He said he’d just leave ’em in the ground and pray. Having no particular anybody to pray to, and vaguely remembering the one time I tried growing tomatoes in Cordova (under plastic, but they still didn’t ripen before the freeze), I decided to buck his advice. How just like me. But guess what? It worked! I think he was imagining tomatoes on the verge, you know, when they start turning white-ish? But mine were solid green rocks. Also he was probably imagining them in a warm room, but I left them in my neighbors shed (with the instruction to eat any that ripened). The first batch was just ripening when we got back, and they are still slowly ripening. Granted, these are not flavorful vine-ripened fabulousness. They actually taste about like supermarket tomatoes (for the same reason). But hell, it was that or nothing. I did by the way, fry my share of green tomatoes and experimented with them in general cooking. Green tomato salad? Pretty darn tasty with a good garlicky vinegrette. Green tomatoes in gumbo? They blend right in, almost okra-ey, but without the slime. I have a batch of green tomato jam in progress, but honestly it doesn’t smell that promising. While you’re munching, how about a few book reviews? I’ve kept up with my Mornings are for Books concept, partly by allowing myself to buy books. I interlibrary loan some, but don’t hesitate much to buy ones I think I’ll want to keep. 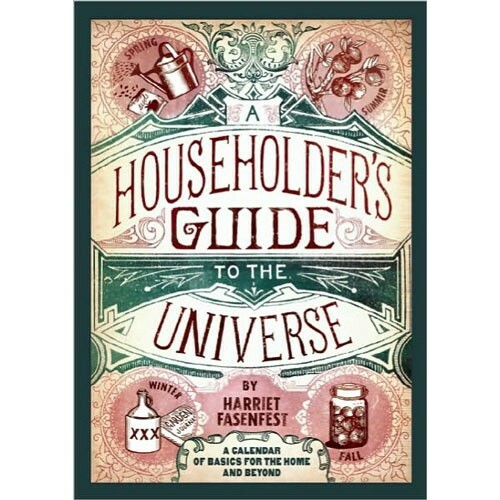 I bought and read Harriet Fasenfest‘s The Householder’s Guide to the Universe in November. Great choice. It is a lovely synthesis of practical things such as gardening advice and recipes, with her very personal and honest account of becoming a householder. Just the sort of writing I most adore to read in the AM hours. The link takes you to some of her articles for Culinate, which is also otherwise a great local/groovy food site. All of a sudden, a whirlwind swept up around us, separating us from the babbling crowd. All the “oh and what do you do? mmm, hmm, how interesting” disappeared and her eyes locked mine, “You love goats?” she said already coming around the table toward me. Goat people are hilarious. “I have Nigerians!” she said, elated. And that was it, the deal was made. We spent the next half an hour in impenetrable goat-talk, and made a date for a goat visit a few days later. Talking to her got me started on a heavy duty scheming streak. I have done a bunch of research since, and I’m pretty fired up. I decided it was time to buy myself a book. Living with Goats is definitely a beginner book. Really I’d have to say it’s more of a schemer book. If you were really getting goats, you’d need something a lot more thorough. But since I am just scheming, it’s perfect. I do wish I had just interlibrary loaned it though, I don’t suspect I’ll need it for reference much. Whew! I had more things I wanted to tell you, about non-sewing projects, and homemade antlers for Bambi-obsessed 3YOs, but it’ll all have to wait. I’ve got to get out to my garden before it’s too late!